Photo: John Sommers II/Getty Images. In January, Sen. Bernie Sanders stood onstage at the Town Hall theatre in Manhattan, slamming what he characterised as Wall Street’s excesses, the pharmaceutical industry’s drug pricing schemes, and the corporate media’s bias. When he took the stage again on Thursday, the key tenants of his stump speech were the same, but one major circumstance had changed: He was effectively no longer a candidate. Throughout his remarks, the Vermont senator did not mention that he did not have the delegates needed to beat Hillary Clinton. Instead, he highlighted the successes of the campaign, and the need to push the Democratic party platform forward. “What the system is designed to do, what corporate media is designed to do is tell you that we cannot achieve real change. The only thing that you can except are incremental, tiny little changes. What our campaign has been about and is about is saying ‘Sorry, we’re thinking big. 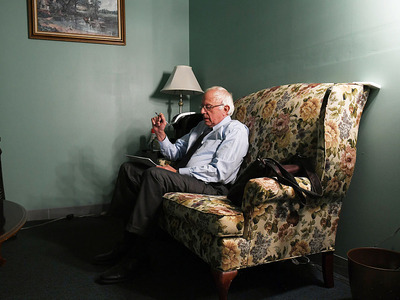 We want real change,'” Sanders said. Since Clinton’s decisive victory in the California primary earlier this month, Sanders has laid the foundation for the end of his campaign. He’s negotiated with the former secretary of state over key campaign issues, and laid off staff. The Vermont senator is no longer attempting to change minds of some super delegates supporting Clinton at the convention and told MSNBC on Friday that he would vote for Clinton in November. “I will do everything I can to defeat Donald Trump,” Sanders said. Earlier in the week, he conceded that it was unlikely he would be the Democratic nominee. “It doesn’t appear that I’m going to be the nominee, so I won’t be determining the scope of the convention,” he told C-SPAN on Wednesday. But encouraged by Sanders’ speech, many of the senator’s fans in New York on Thursday welcomed his reluctance to drop out of the race. Throughout the speech, supporters occasionally interrupted Sanders, urging Sanders to run, and even decrying what some audience members perceived as rigged elections. Luanne, a Sanders supporter from New Jersey sporting a “Hill No” pin, said that she would head to the Democratic National Convention in Philadelphia, and hope that Sanders somehow managed to wrangle the nomination. Photo by Matt McClain-Pool/Getty ImagesBernie Sanders backstage in Vermont before an address. While many top left-leaning organisations like the AFL-CIO and the Sierra Club have come off the sidelines to support Clinton, some Sanders supporters have held out. Last week, high profile Sanders backers like actor Mark Ruffalo and Friends of the Earth Action President Erich Pica testified in front of the Democratic National Committee to advocate for adding to the party platform a nationwide ban on hydraulic fracturing and a tax on Wall Street speculation. Following a meeting with the DNC’s platform drafting committee last week, Pica told Business Insider that there was little motivation from members to support Clinton while Sanders was still in the race. Following his loss in California, some of Sanders allies in Congress have hinted that its time for the senator to unite the Democratic party by throwing his support behind Clinton. “There’s no question in my mind that Hillary Clinton will bring us together and lead us to victory in November,” Minnesota Rep. Rick Nolan, a Sanders supporter, said in a statement earlier this month. But on Thursday, he emphasised that he wasn’t quite ready to accept defeat yet.